Looking for exposure to commodities? Here are three top stocks to consider for 2019.
Commodities are the base products, pulled from the Earth beneath us, that allow material things to be created. The commodity category covers a broad range, from oil to iron ore to gold. Without these products you wouldn't have cars, buildings, or the fancy electronics increasingly dominating the world. If you are looking to cash in on these fundamental materials, then three of the top commodity stocks to look at in 2019 are ExxonMobil Corporation (NYSE:XOM), BHP Group Limited (NYSE:BHP), and Franco-Nevada Corporation (NYSE:FNV). Exxon's core business is drilling for oil and natural gas, key energy sources that power everything from cars to planes to the power plants that generate electricity. Oil and gas have been, and still are, key to economic growth, supporting living standards in developed markets and helping to raise the living standards of those in developing markets. Exxon's business spans the entire value chain, from upstream (drilling) operations through downstream (refining and chemicals) businesses that create the products, such as gasoline, that actually get used in day-to-day life. This diversification helps provide balance, since oil price swings can be dramatic and swift, as the recent oil price drop clearly demonstrates. Low oil prices hurt the upstream side of Exxon's business, but as oil is also a key input on the downstream side, low oil prices are a net benefit on the other side of its operation. In addition to diversification, Exxon is also highly conservative with its balance sheet. Long-term debt only makes up around 10% of the capital structure, placing the energy giant at the low end of its peer group on the leverage front. It is, essentially, designed to handle the ups and downs of the energy sector. Nothing proves that more than the incredible 36 consecutive years of annual dividend increases the company has amassed. And the stock looks relatively cheap today, trading with a yield (around 4.1%) that's higher than it has been since the 1990s and a price to tangible book value that's lower than it has been since around that same time. BHP, formerly known as BHP Billiton, is one of the world's largest commodity producers, with material operations in iron ore (roughly 40% of underlying EBITA in fiscal 2018), copper (28%), coal (19%), and energy (14%). It also has a potash mine under consideration that, if built, would be among the largest in the world. The company, however, has recently gone through a big overhaul, jettisoning non-core mining assets (via the spin off of South32) and selling its onshore U.S. drilling business. The goal of these moves was to streamline BHP down to just a few key investments, and within those investments to focus on just its best opportunities. In fact, the company recently held a conference dedicated to explaining its updated views on capital allocation. Management basically admitted that it hadn't been a particularly good steward of shareholder capital during the last downturn in the highly cyclical commodity space, and explained why its new approach would be more robust. The changes highlighted include the streamlining and capital allocation efforts noted above, but also a renewed focus on maintaining a strong balance sheet. 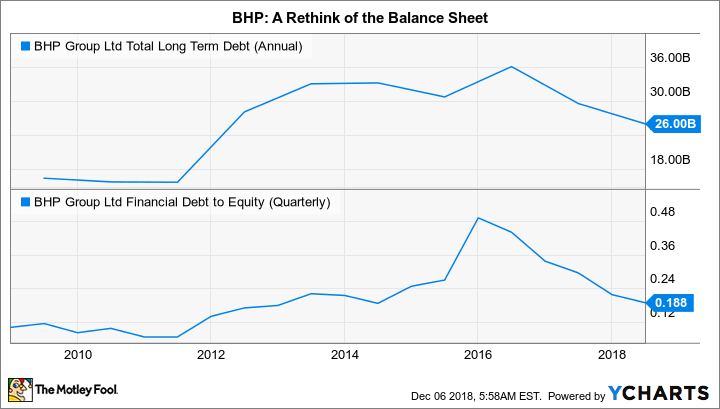 To that end, BHP has cut long-term debt by 25% over the last two fiscal years. Long-term debt now makes up around 30% of the capital structure, a very reasonable figure that puts the company's leverage toward the low end of its closest industry peers. With positions in some of the world's most important commodities, BHP looks like it is in fighting condition for the next commodity cycle. Adding to the allure is the stock's over-5% yield. The last company up is Franco-Nevada, which doesn't mine or drill for anything. It's what's known as a streaming and royalty company. Effectively, it provides cash to commodity producers, notably gold and silver miners and oil drillers, in exchange for the right to purchase these commodities at reduced rates in the future (or for a preset piece of the sales price in the case of royalty deals). This saves Franco-Nevada from having to worry about the complications of working the assets in which it invests. Moreover, the company tends to have generally wide margins in both good markets and bad since the prices it pays are usually set as a percentage of current spot prices. To give you an idea of just how protected the company is from commodity volatility, it has increased its dividend every year since going public in 2007. That's 11 years and counting, a period which included a deep commodity downturn. 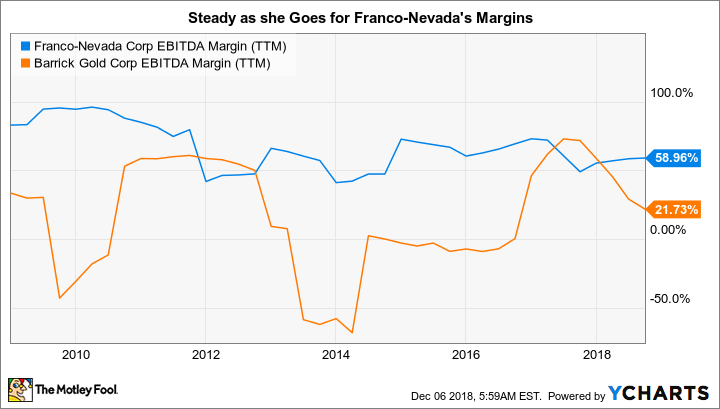 It's also interesting to note that Franco-Nevada has no long-term debt, generally preferring to issue shares as it inks new deals. This conservative approach makes a lot sense: The best investment opportunities for Franco-Nevada will be during downturns, since that's when miners are most desperate for cash and more willing to ink streaming and royalty deals. Maintaining a rock-solid balance sheet makes getting access to cash in downturns easier. Precious metals (largely gold) are the big commodity here, making up between 80% and 90% of the company's revenues over time. However, Franco-Nevada used the last oil downturn to opportunistically grow in the energy space, so there's some oil and gas exposure here too. That differentiates it from other streaming companies that are focused only on metals. Franco-Nevada is also one of the most diversified streaming companies, with 51 producing mines, 58 producing oil and gas assets, and over 260 other assets in some stage of development or exploration. Although Franco-Nevada's 1.4% yield seems miserly compared to those of Exxon and BHP, it is actually a fair yield compared to its own history. And if you are looking for a way to invest in precious metals but want to sidestep volatility, the company's streaming model, strong financial foundation, and highly diversified portfolio are a great way to do it. If you are looking to invest in commodities, an approach that balances risk and reward is key, as the sector is prone to swift and volatile ups and downs. Exxon, BHP, and Franco-Nevada are all conservatively financed and pretty well diversified, and they all offer investors a fair amount of income via dividends to help you stick around through the inevitable volatility you'll face. If you are looking for a commodity stock, all three should be on your short list today.